It was revealed last week that Gary Busey took a role in the upcoming b-horror Piranha 3DD, the sequel to the Alexandra Aja remake that hit theaters only last year. 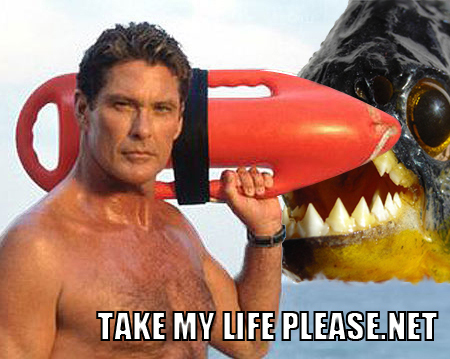 While some fans may think that's enough for a bizarre time in bloody waters, the film has also snagged The Hoff himself, David Hasselhoff, BD reports. While his role will be limited to a cameo, it's got me curious if we'll see him running in slow motion (preferably from the bloodthirsty fish) or maybe busting out "Hooked on a Feeling", if he's not hooked on a fishing line. One thing is for sure: This movie is going to be huge in Germany.